Read this review to understand that Coinicor is an investment scam that you should not invest your money with. 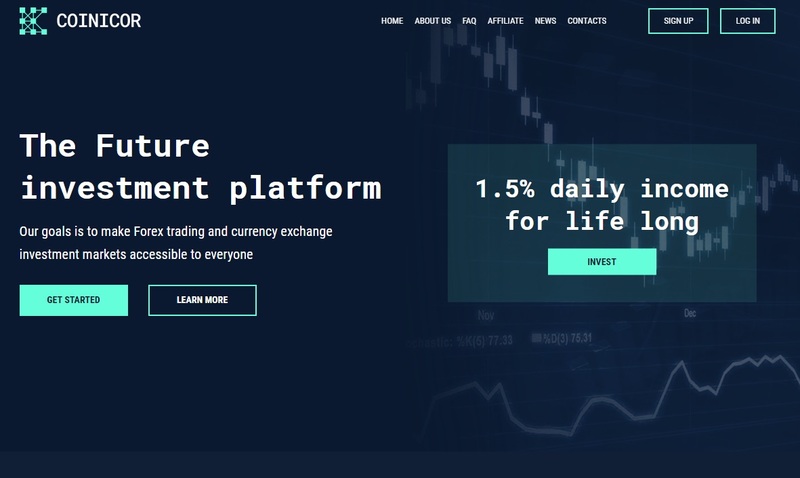 The statements of Coinicor are bold, it is supposed to be platform that allow Forex trading, crypto exchange, lending, crypto mining and startups investing. The main point for investors is the investment plan with 1.5% daily returns, which is 45% per month. Let’s have a closer look. The first thing you should have a look at with any investment offer is the returns. With 45% per month you can be sure you are dealing with a scam, no matter the rest. There is no way for a legitimated business to make this kind of returns on regular basis, especially not in unstable industries like Forex and cryptocurrencies. So, Coinicor is scam, it is clear. Coinicor says it is a company registered in the UK. While it’s true that it has a tax registration, it is only two months old. What’s even more important, is that Coinicor is not registered with the Financial Conduct Authority. It is not authorized to provide investment services, so it’s offering is illegal. It’s obvious that Coinicor is a Ponzi scheme that will just play with deposits and use them to maybe pay out some profits. There are no real profits, no real business activity going on, just a scam. Coinicor is a scam that is going to collapse soon, you should stay away from it. If you are interested in real financial and crypto trading, try a free demo account with a regulated broker to see how it works.